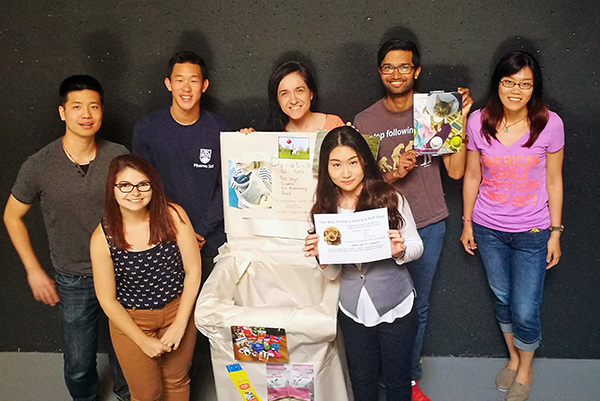 A group of graduate students from the Faculty of Pharmaceutical Sciences are stepping up to help BC’s in need animals this spring. The initial idea came from second year PhD student Yuejian Liu who is studying the enzymes in the body that metabolise drugs under the supervision of Dr. Abby Collier and Professor Michael Coughtrie. It’s work that has great potential to improve how effective drug treatments are, but it was a lab conversation on a very different topic that got this particular project started. Yuejian contacted the student societies in the Faculty and found enthusiastic backing for the drive. Jennifer Brown and Ana Koperniku from PharGS, were both heavily involved in the organisation as was Nirma Vadlamudi, the President of AAPS. In fact last year’s drive was so well supported that the team decided to launch another effort this summer. The donation drive runs until May 11th. A recycling bin in the Pharmaceutical Sciences building has been converted into a donation bin for the next few weeks and the team have also arranged times for any visitors who want to make a monetary donation on the spot. There is a list if things that are needed by the shelter, including pet food, blankets, litter and pill pockets. Then on May 12th, the day after the donation drive is finished Yuejian and her colleagues will be packing everything up to present the donations to the shelter in person. Thankfully they have already made plans if donations are particularly generous.